The fourth volume in a series of four includes the stories Nicholas Hagger penned during the 1990s. They explore the themes of homecoming and reality. 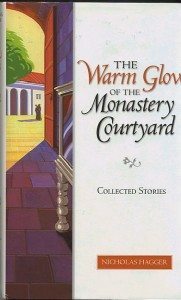 In The Warm Glow of the Monastery Courtyard Nicholas Hagger portrays a world teeming with vividly-drawn characters who live under the shadow of mortality with the predominant feeling of homecoming and reality. In his work the Universe is bathed in the warm glow of the mystic Light and the miraculous is never far away, like the unembalmed but strangely undecayed body of the saint in the title story. Nicholas Hagger’s situations are alive and fresh, and he reveals the truth about his people with a penetrating insight. A D-Day soldier and a fisherman, the owner of a castle and a pauper are all observed with a deep sympathy that relates them to ultimate reality. These stories have the exquisite detail of the carefully crafted, sharply-observed miniature, a form he has made uniquely his own. Nicholas Hagger’s illumined, painter’s eye reveals a fresh, concrete universe in which people go about their multifarious, everyday lives – their social existences – against the background of the enduring One. The art is in the economy; the balance between the fresh, concrete everyday world and the eternal, as well as in the logic of the images, which culminates in perception or revelation. It is akin to Holbein’s method in his famous painting The Ambassadors (1533). There, two French ambassadors, one ecclesiastical and one secular, stand on the high altar pavement of Westminster Abbey, the mystical centre of the English Church, on the very day Henry VIII broke with the Church of Rome. All the literal and symbolic details of the painting combine to give a sense of unease at the impending division of Christendom. Just as the artistic eye of Holbein reveals both the particular and the universal truth of a situation, so these mini-stories use vivid images to suggest disquieting and serene events. Ultimately, their appeal lies in the author’s poetic approach to experience, which illuminates mundane everyday reality through glimpses of a something beyond.